The first cold front of the 2018/2019 winter season produced strong northwest winds, cloudy days and cooler than normal temps. Anglers and guides were able to put together some good days by moving and adapting to the weather and water conditions. 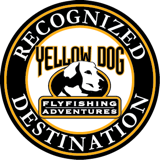 El Pescador Lodge was happy to host a fly fishing and photography workshop by Yellow Dog Outfitters featuring well known outdoor photographers Jim Klug and Bryan Gregson. It was a treat to see the amazing images captured by the participants while on land and in and under the water. Bonefish in deeper water (2-4 feet) saved the day when wind and clouds made sight casting difficult. Winds, waves, and clouds made spotting permit harder, but several were landed, including a double permit day by Kim. Westerly winds provided the opportunity to fish the Mainland for Tarpon and Snook. The best action was around the Mangroves.